Gold Valves® are Race Tech's Custom Valving Kits. They are designed to break through the limitations of stock piston designs. Research has shown that the stock piston ports induce unnecessary harshness. Gold Valves are designed to reduce piston restriction so harshness is dramatically reduced. This allows the valving stack to be personally tailored to the individual rider. Tests have proven that bottoming resistance is actually increased as the harshness is decreased. Traction is also improved. The key is a careful combination of the Gold Valve itself and the valving stack. Custom setups are computer calculated with the Digital Valving Search (DVS) on our website. Developed and refined for over 18 years, this computerized system calculates the proper setup for the individual rider including spring rates and clicker settings from over 300,000 possible combinations. 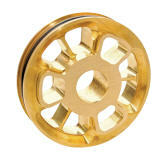 Gold Valve Kits are designed to be installed by competent individuals and suspension tuners. A few specialized tools are required. We can help you with choosing the required tools. If you are doing the installation yourself and you get stuck we have free technical support available 951.279.6655 x109. Hi-performance valving piston enables outstanding bottoming resistance while retaining a plush controlled ride. Extremely versatile. For All Types of riding including Motocross, Arenacross, Supercross, Freestyle, Offroad, Trial, Hillclimb, Supermoto, Street, Road Race, Drag Racing. Rebound Gold Valves - Many rebound valving systems are grossly inadequate. No matter what modifications are attempted, the forks will never perform with precision and control. These Kits offer the advantage of both adjustable Mid-Valve and Rebound. Available for most Dual Chamber Showa, KYB and WP Forks. HFR Rebound- Hi-Frequency Response Rebound Gold Valves are specifically designed for racing but can be used for street applications as well. They provide better traction on small or sharp bumps that require fast valve opening and closing. For Street and Road Race. Shock Gold Valves control both Compression and Rebound. G3-LD - The latest design Shock Gold Valve for the 46mm KYB and 50mm KYB, Showa and WP shocks provides better control for the rider. This piston design creates more shim leverage and decreases the angular shim deflection. The benefit is more consistent damping and faster lap times! Choose this option when it is available.